These are a simple little bowls you can fill with anything you desire from savory appetizers to mouth watering desserts! I love them sprinkled with cinnamon sugar and then filled with vanilla or coffee flavored ice cream drizzled with some hot fudge sauce, perfect for Cinco de mayo but just use flour tortillas instead of wontons! You can go from salads to desserts all in the same appetizer party frenzy. See some of the suggestions below just to name a few! Get your imagination going you can make a whole lot of different appetizers for your party gatherings and tailor these to all your guests favorites! Spray you cupcake tins with cooking oil. 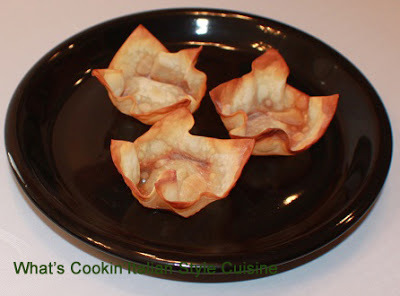 Place a wonton in each cup. Bake until browned and crispy around 15 minutes on 350 degrees. Suggestions and Notes: Brush the bottoms with a little rum and melted butter before filling for desserts. For the savory styles, brush with melted butter and a little white wine. For savory filled cup fill with a Mexican refried bean dip, add also lettuce, tomato and top with sour cream, chopped olives and jalapenos. 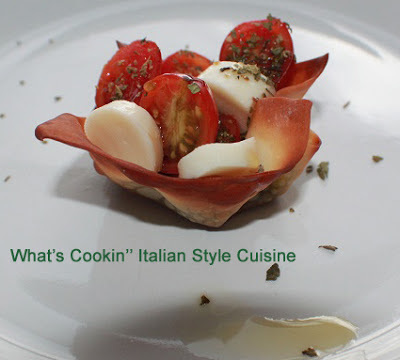 You can fill with chopped tomato and mozzarella and fresh basil for a great started appetizer as shown in photo. Black beans, avocado, garbanzo beans, corn, mixed with a salsa for a Tex Mex style. Use a tuna salad, egg salad or ham salad and chicken salad all great fillings. Cream cheese mixed with smoked salmon. Cream cheese mixed with crab meat. Cream cheese mixed with chopped peppers, olives, tomato, onion and tuna. I am sure you can come up with hundreds of more ideas! You can make these bowls ahead of time for company to have on hand freeze them on a cookie sheet then store in a freezer bag laying flat until ready to use! The skies the limit of imagination! These hold up great with any filling.